Gone are the days when installing home lifts were once a style quotient or for elder people with mobility issues. From a two-storey building or a luxury residence, today everybody needs home lifts. Residential lifts are nowadays becoming more popular to improve accessibility inside home at quickest possible. 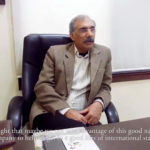 With the change in lifestyle and increase in economic growth home lifts which was once considered as luxury symbol as now become a need of every man. Even people these days are gravitated to those homes which has residential lifts. It not just enhances the beauty of home but also increases the resale value of the building consequently installing home lifts are considered as profitable investment. Elite Elevators, the No:1 home elevator suppliers in India are specialized in providing strictly the residential lifts only. 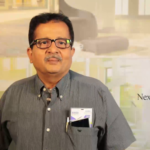 They are based in Chennai but providing the valuable service to all over India. With tie up with Thyssenkrupp home elevators, Italy brings you the best and safest mode of travel inside your home. Elite Elevators offer extensive range of home elevators at best reasonable price with quality and safety as their top priority. 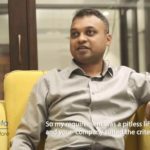 On designing an elevator, Elite Elevators follows 194 parameters of safety and European standard to offer top quality to their customers and which is why have been awarded as ‘World’s Safest Home Elevators’. 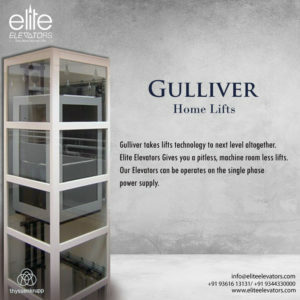 Among many top-quality residential elevators, Elite Elevator presents Gulliver Lift with hydraulic mechanism to define your style proposition. This elevator comes with soft start and stop technology to make your ride safe and jerk free. To install this elevator, there is no need of pit or headroom and are functionable with just single power phase. Elite Elevators takes pride in taking their home lifts to next level by designing it with modern look with world class technology which can effortlessly elevate up to five floors with less noise and vibration. Gulliver Lift, is designed with its own metallic structure made up of galvanized steel, strong and weather proof features which makes it ideal for both inside and outside premises. Moreover, installing this lift outside your home premise require just minimum pit with no machine room required and functions with single power phase as well. 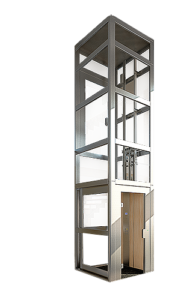 The Gulliver Lift are customizable as per the home needs with metallic shaft with glass on all four sides so that you can have an outside view from all directions while travelling. Apart from that, it comes in different sizes and finishes and does not require oil lubrication at least for next 10 years. 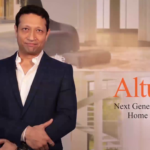 This home lift designs comes with unique style in the market which redefines luxury with overall comfort and safety as top priority. This hydraulic lift is a combination of German Engineering with Italian design which comes with customization choice for every customers preference.